Anchor Your Tree: Cats are notorious Christmas tree climbers. If your tree isn’t anchored properly, it could fall over and injure your cat — not to mention make a big mess. Avoid Tinsel: Tinsel gives your tree extra sparkle, but it can also pose a serious health risk to dogs and cats. When consumed, tinsel can result in stomach conditions that will require an emergency visit to the vet clinic. Hang Up Lights: Keep an eye on any lights you hang around the home to ensure they are out of reach. Pets sometimes chew and claw at cords, which can result in electric shock. Avoid feeding your four-legged friends a special treat from the table — as tempting as it may be. Foods with chocolate, nuts and alcohol can be poisonous. Encourage your guests not to feed your dogs and cats from the table as well. Most dogs are driven by their noses, which can make the smell of fresh-burning candles worth investigating. Keep candles out of reach of your dogs, or other curious pets, to avoid painful accidents and potential fires. Place a trash bag close by during gift unwrapping to keep harmful materials away from your pets. Ribbons, wrapping paper and tape are a common source of intestinal blockage for animals. The holiday season isn’t over until the New Year. It’s important to have a plan to keep your pet calm if your community or neighbors like to celebrate with fireworks. If necessary, make a nest for your dogs and cats in an unused room or the basement. Insulating your pet from the noise can reduce stress and panic. 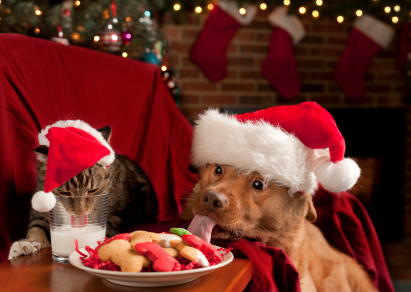 Follow these few tips and both you and your pets will have a happy holiday season.